Sweet and juicy grapes from your own garden. Grow your own sweet and juicy grapes right here in the UK. The fully hardy vines are highly productive, giving you pounds of delicious grapes each September. Easy to grow and care for, grapevines are highly decorative as well as productive. Perfect for greenhouse, garden or in a pot on the patio. Supplied as a pair of vines, 1 x each Grape Boskoop Glory and Grape Witte Van Der Laan in a 2L pot. Fill your fruit bowl for weeks with juicy, homegrown grapes from this pair of grapevines. Grow your own deliciously sweet, juicy grapes from your own grapevines right here in the UK. Producing plenty to fill your fruit bowl for weeks, these grapes will be bursting with flavour and healthy goodness when you harvest them each September - simply irresistible. Our collection consists of 1 vine of each Boskoop Glory (red) and Witte van der Laan (white) - both are prolific fruiting, incredibly winter hardy and very easy to grow. Decorative as well as productive, grapevines make a stunning feature when trained over a pergola and their large leaves will provide natural summer shade - plus you can always use the young vine leaves for making dolmades! Perfect in a pot on your patio or in the ground, these top-quality vines will reward you with your very own delicious, sweet, juicy grapes for years to come. Remove all flowers for the first two years after planting. 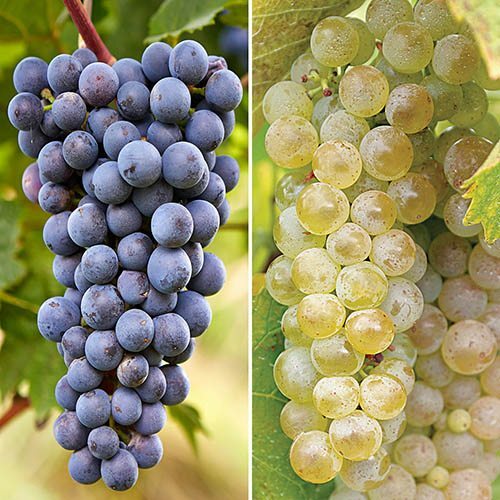 Allow three bunches of grapes on three-year-old vines and about five on a four-year-old vine – slightly more if growing well. When planting in the ground, dig over the soil, break up any compaction and enrich with compost or fertiliser. Plant in weed-free ground. Plant vines against walls and fences 1.2m (4ft) apart and 12.5cm (9in) away from the wall. Plant vines in the open 1.2-1.5m (4-5ft) apart in rows 1.5-1.8m (5-6ft) apart. In their first year, water grapevines well and regularly, especially if there is a prolonged dry spell. Mulch in spring when the soil is moist, to suppress weeds, placing stones or gravel, 5-7.5cm (2-3in) deep around the base of the plants. The main pruning time is November - December, while training, pinching out new shoots and fruit thinning, takes place in spring and summer.